"We've been leaders in Aquaculture since 1984, with quality and service unmatched in the industry"
Ajay Fibreglass Industries Pty Ltd is the trusted name in the Aquaculture Industry. The highly experienced team, lead by a committed hands-on owner of 33+ years assures you quality and service unmatched in the industry. Hundreds of standard designs and moulds complimented by a willingness to cater to individual needs guarantees you the client total satisfaction every time. 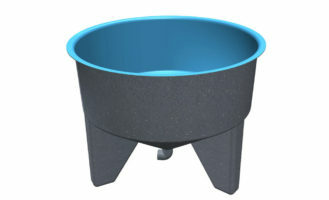 Flat base circular tanks are an economical option for open top storage or grow out application for most marine species. 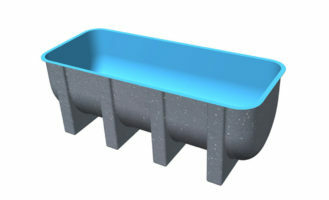 The flat base range of tanks are available with side or central drainage (central drainage requires a pipe channel in base). Larger tanks are supplied in two of more sections to allow for economical freight options. 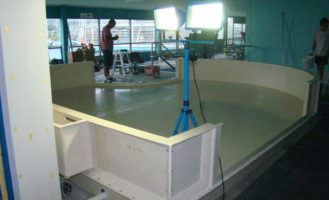 Custom design sumps and skimmer box assemblies are available on request. Available in a wide range of colours. Lids are available and priced on request. Our hemispherical tank range ensures there are no dead spots and water circulation is excellent. Ideal for specific aquaculture and hatchery applications. 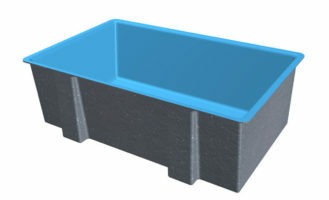 Custom sumps and skimmer box assemblies are available on request. Available in a wide range of colours. Lids are available and priced on request. 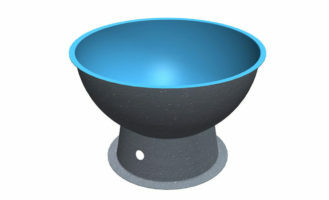 The Parabolic design is very popular and is used in most prawn hatcheries. This space efficient hatchery tank design has excellent water circulation qualities and provides total drainage into a sump or raceway. Lids are available and priced on request and these tanks are available in a wide range of colours. A variety of outlet sizes and designs are available. Air pipe brackets are also available and quoted on request. Our space efficient rectangular tank designs are used for industrial or aquaculture applications where every bit of space needs to be utilised. 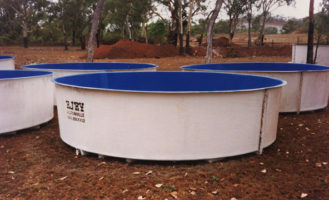 The long flat wall sections means that the tank laminate design is much heavier and the cost per litre is more expensive than circular tank options. Custom built raceways are available on request. Lids are available and priced on request and these tanks are available in a wide range of colours. A variety of outlet sizes and designs are available. 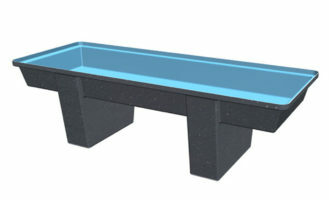 Aquaponics grow beds are available in several standard sizes; however, a custom design and manufacture process enables us to meet your needs every time. 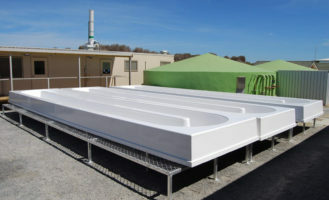 Our innovative modular grow bed design allows components to be manufactured at our factory, shipped economically, and then long lengths assembled on site. A custom design and quotation service is available at no cost, just contact us. A variety of outlet sizes and designs are available. Ajay Fibreglass specialises in custom-built aquarium tanks. All tanks are custom designed, engineered, and manufactured, to meet specific client’s needs. Most of the large tanks supplied have involved careful planning to ensure the required onsite completion process is carried out in a very professional manner. Clients include Reef HQ and A.I.M.S in Townsville, Sydney Aquarium, Melbourne Aquarium, and many other smaller aquarium specialists. Contact Ajay today for an obligation free quote and advice. 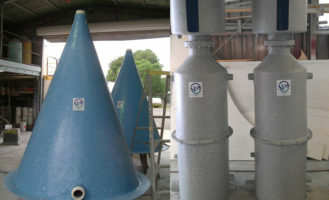 A huge range of filters, foam fractionators, oxygen cones and clarifiers have been manufactured. Standard models as well as custom built designs are available on request. A range of rectangular raceway tanks are available and any of your requirements will be quoted on free of charge.